Posts related to the second jazz CD release by Ramona Borthwick as a leader. Dr. Rick – Ramona, please give us some of your background. Tell us where you studied music, maybe some of your biggest influences as a student of music. 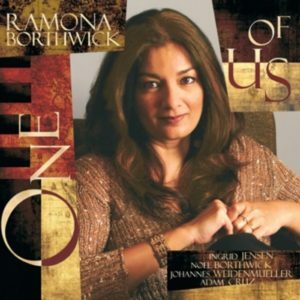 Great new release by Boston pianist and composer, Ramona Borthwick. This contemporary release embraces beautiful melody and an undying sense of groove. The group dynamic is superb, and the rhythmic interaction, from Rubato, time signature differences, straight eighth feels to straight ahead swing is met with a confidence and musicality. The soloists are excellent, spatial and melodic. 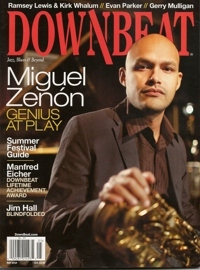 ONE OF US in Downbeat Magazine’s HotBox! Artist Interview at the Italian jazz webzine ‘Sound Contest’. 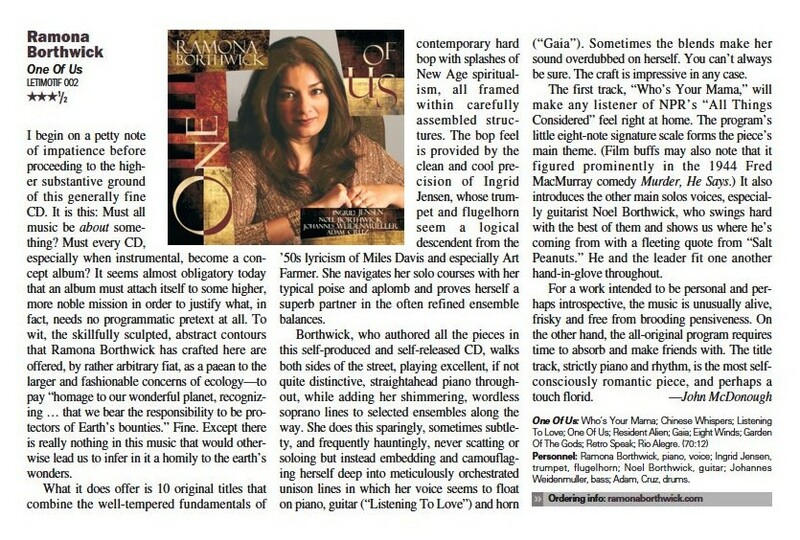 And a CD review in Greece’s Jazz & Tzaz magazine. Couple of video clips from the CD release concert last month. Daughter of famous Bollywood composer Enoch Daniels, pianist Ramona Borthwick took her first musical steps in Bombay and there, along with husband, guitarist Noel Borthwick, recorded “Sound Matters” precisely 20 years ago, one of the first recordings of contemporary jazz in India. She later moved to Boston, where parallel to music, she got involved with graphic and web design. “One Of Us” is her second album and continues to be based on the same artistic blend of swing and lyricism which was present in her debut album in 2006 (“A New Leaf”). Ramona has the ability to match difficult rhythms and melodies, and builds a complex mosaic of components found in modern jazz, European music, sometimes in the Indian tradition and often in Latin, especially when accompanied by the piano with flexible vocal phonetics. The rare gift of being an equally good pianist, singer and songwriter, makes a difference to a degree that can hardly go unnoticed. with the cheerful Latin “Rio Alegre” closing the album. All the musicians have played brilliantly, the band comprising Noel Borthwick on guitar, Ingrid Jensen on trumpet and flugelhorm, Johannes Weidenmueller on bass and Adam Cruz on drums. The wonderful music of One of Us dwells on the interconnection of all things. Pianist Ramona Borthwick and her quartet make this happen on two important levels. First, they play from the same script as if they had studied the pages and came to make each their own in a very special and individual way. Second, there is a seamless connection between each of the songs and the quartet’s leader; Borthwick brings her considerable talent in weaving everything together with a secret gossamer thread. Both of these attributes speak volumes about the sensitivity with which each of the musicians handles the considerably—sometimes dense—material. “One Of Us” has received radio play at several stations in the last few weeks- many thanks to the radio stations & hosts for their support and broadcast of the music. My upcoming quintet CD has been sent to mastering, whew! (It was recorded last summer in NY). Being witness to another series of mixing sessions was a great learning process for me – not entirely fun I admit – my respect & admiration for all the sound engineers out there has grown infinitely 🙂 Dan and Noel did a great job, and I can’t wait to hear the finished result. Have just started on the artwork for the CD digipak – should be interesting. Will keep you posted on how things are moving.